A girl returns from boarding school to her sleepy Merseyside hometown and waits to be reunited with her childhood friend, Harriet, chief architect of all their past mischief. She roams listlessly along the shoreline and the woods still pitted with wartime trenches, and encounters ‘the Tsar’ – almost old, unhappily married, both dangerously fascinating and repulsive. Pretty, malevolent Harriet finally arrives – and over the course of the long holidays draws her friend into a scheme to beguile then humiliate the Tsar, with disastrous, shocking consequences. 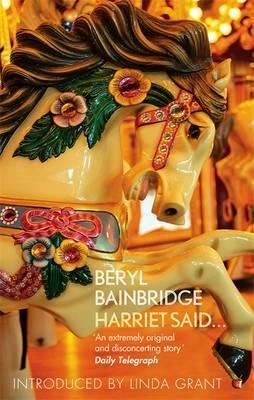 A gripping portrayal of adolescent transgression, Beryl Bainbridge’s classic first novel remains as subversive today as when it was written. It is one of those books that, although it is well written and makes compulsive reading, can’t be said to be enjoyable and the characters are not at all likeable. A year ago to be called a Dirty Little Angel would have kept us going for months. Now it was not enough; more elaborate things had to be said; each new experience had to leave a more complicated tracery of sensations; to satisfy us every memory must be more desperate than the last. It is Harriet who decides their actions and dictates what to write in the diary. They peek through the windows of the Tsar’s house and watch as he ‘lay pinned like a moth on the sofa‘ underneath his wife as she ‘poisoned him slowly, rearing and stabbing him convulsively. This sickens the 13 year-old, who wants to be loved by the Tsar, but Harriet decides that he is weak and submissive, saying that he likes being a victim and must be punished in a way he doesn’t like. From that point onwards events move rapidly to a shocking conclusion. I’ve read a few of Beryl Bainbridge’s books and each one has kept me engrossed. Harriet Said is the first one she wrote, based on a real event, and although she submitted it for publication in 1958 it wasn’t published until 1972 because of its subject matter – ‘What repulsive little creatures you have made the central characters, repulsive almost beyond belief!‘ wrote one editor. I found it a disturbing story as the manipulation escalated and everything began to spiral out of the girls’ control as childhood fled from them. I will admit that I’m not drawn to those young women. Ha! All that story in only 192 pages. Someone recently was talking about how much Agatha Christie was able pack into a minimal amount of pages. Seems that this author has the same talent. Oh, this does sound eerie, Margaret! And I know just what you mean about a book that draws you in, but that you can’t say you enjoy, in the sense of being entertained. Still, it sounds compelling.